TFS 2010 VS2012 Windows 8–Get specific version doesn’t get it! Found the cache and deleted it . Didn’t solve anything. Talked to a wise man at the place of work. By his words only when Check In performed the Resolve Conflicts appears for merge , if you are in a check out mode by the file the merge won’t be performed . Is it so ? Did you try to get latest with checked out file and got “ you have a pending edit “ ? How can I get somebody else’s changes when I am in the middle ? 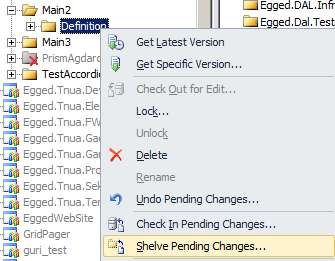 My solution was to shelve the pending checkouts and I will return it after the “Get Specific Version”. What would you do ?